While push notifications have become ubiquitous, their sibling, the in-app message, has received less attention. This is unfortunate, as in-app messaging can make or break whether a user decides to stay around or not. It’s important that marketers carefully craft in-apps that streamline the app experience and direct users on how to gain value from the app. Our data proves that sending in-app messages will generate stronger user engagement. Apps that communicate in-app in some shape or form see a 40% lift in retention in the first and third month following the user’s first session. In the second month, these apps see an approximate 75% increase in user retention. To get a better feel for which types of apps benefit most from in-app messages, let’s break down the lift in retention that each category receives from using these messages. The news is great for Entertainment, Social Networking, and Photography apps, with 71%, 69%, and 67% increases respectively in the number of users who stay with an app for three or more months. What is so impressive about Entertainment’s lift in retention is the fact that it is paramount, but exceedingly difficult, to create a seamless experience in these apps. It’s also clear that Social Networking receives a lift because messaging is at the very foundation of social engagement, while it’s less obvious how essential messaging could be to a Photography app. Marketers looking for even greater retention results will find them by effectively onboarding users and demonstrating what the app can do on first launch. This is a user’s first impression of the app, so ensuring that they understand how everything works and what your app offers is critical to maintaining their interest in the long run. In-app messaging ideally will reach users with little delay, so communicating with them in real-time will direct their actions towards finding what they need. Compared to apps that do not send in-app messages, those that have implemented an onboarding experience driven by in-app messages witness a 49%, 88%, and 32% lift in retention for each respective month following users’ first sessions. Nearly 60% of users continue to use apps that have implemented onboarding in the next month, 48% stay for a second month, and approximately 29% will return for a third. Compare this to apps that don’t use onboarding at all, which see 39%, 26%, and 22% of users return in the months following their first session. What makes an in-app message engaging? At the center of the screen. This format is good to provide users with information without much fluff. As a full-page message or interstitial that provides an opportunity to appeal to users’ aesthetic tastes. As a bottom banner for subtle communication. As a top banner for a push notification feel. Each type is useful for different reasons, but some positions see better results when it comes to engagement (the number of sessions per user within seven days of message receipt) and conversion (the number of users who received the message and then completed the desired event within seven days). Notably, full-page interstitials are deeply engaging, but do not drive conversion as well as a centered in-app message. On average, full-page interstitials see over 3X as much user engagement as messages that appear at the top. Visual appeal is key. A full page interstitial can be extremely effective if it is designed to take advantage of brand image and tone to communicate in an enticing way. At the end of the day, this is what stays with consumers when choosing their apps. Some in-app messaging types are helpful for brand experience, while others are great for directing users to obtain value. Our conversion rate data shows that center-page notifications reign king in encouraging immediate action. Keep in mind that conversion is a tough metric to look at in aggregate, as each marketer has a different goal in mind for impacting users. On the whole, however, 7.2% of users who received a centered in-app message performed the desired conversion event within seven days, compared to full-page’s 2.9%. Influencing mobile users to take action is one of the micro-level contributors to the end goal: creating loyal, engaged customers and a positive brand perception, which is a complex challenge. 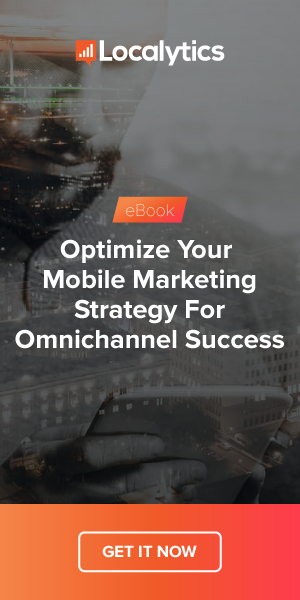 Good conversion is simply a stop on the journey, while stellar retention is the final obstacle to achieving mobile marketing nirvana. Localytics is the leading mobile engagement platform across more than 2.7 billion devices and 37,000 mobile and web apps. Localytics processes 120 billion data points monthly. For this study, Localytics looked at apps that have integrated in-app messaging across both iOS and Android. Engagement is defined as the number of sessions app users completed within seven days following receipt of an in-app message. Conversion rates are defined as the number of users who performed the desired conversion event within seven days following receipt of the message. The timeframe for this study was February 1, 2018 through May 31, 2018.